We talk about them a lot on this site, on twitter and facebook but What is Feel the Force Day? One of the reasons FEEL THE FORCE DAY exists is to make it possible for guests with disabilities to enjoy a sci-fi convention / comic con in the same manner as (and I hate to use this word) normal guest. Not all disabilities are visible and some are very visible – so the amazing team at FEEL THE FORCE DAY put on an event that EVERYONE can feel comfortable at. FTFD events are accessible for wheelchairs and scooters of all shapes and sizes, aisles are wide to allow guests with walking aids to pass, tables are at a height that chairs and shorter guests can access. There are sensory rooms and touch tables for guests with visual or hearing problems, quiet rooms for guests who are anxious, autistic and have other issues with noise and crowds. Guests are encouraged to touch props and costumes – it is a festival of sound and vision, touch and taste – something for all the senses – even if that means very quiet and one on one experience. Feel the Force day was thought up by two lovely chaps – Simon and JJ. They know about the daily struggles that people with disabilities have as Si’s brother Matt is in a chair and JJ works with many people with lots of disabilities including the lovely Jimmy who is blind and deaf. Our team (known as #TEAMRUN4FTFD) is a fluid group of runners and supporters – the more the merrier. Just the 2 of us in 2016 – just to get the idea of what it was like. Both ran the 5k and Sam valiently attempted the half but had to pull out with injury. 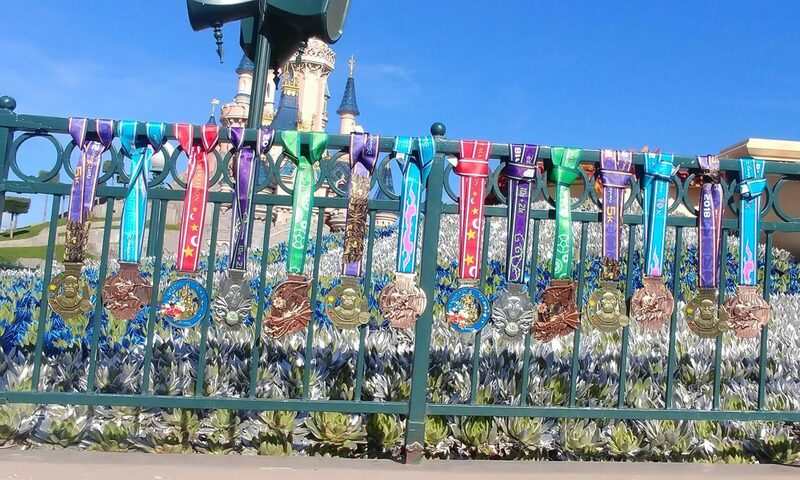 A team of 6 covered the 2017 Disneyland Paris race weekend. All 6 of us ran the 5k (at 8pm on friday night) and 4 of us that ran the 10k (at 7am on saturday morning). The 2018 team had 4 runners – and 2 of us managed the 36k challenge of the 3 races over 2 and a half days .. we rank over 100k between us and raised £1,000! All money we raised is ploughed straight into Feel the Force Day events. In 2018 over 7000 people attended the Feel the Force Day event in Peterborough, thanks to the donations they receive and the money we raised it allowed the low ticket price of £4 and all carers attended free. When you consider big comic cons and events in London and elsewhere around the country charge approx. £20 per adult (and carers have to buy a ticket) child tickets are not much cheaper and there are little to no facilities for guests that may need extra help or accessibility. We are SO passionate about this cause and so are the people who are running alongside me. If you can help in anyway please head over to our just giving page – http://bit.ly/run4ftfd19 and share this page if you can to help us raise more money.